APPARTEMENT EN PLEIN AIR SALON, CUISINE & LA SALLE À MANGER EST DANS UNE TERRASSE COUVERTE. Pour sortir dans cette région, vous devez passer par la chambre des maîtres. ACCÈS DIRECT À L’APPAREIL VERS LES ESCALIERS. We really enjoyed our stay at Sabbia Condos. The complex, pool and unit were very well kept! Our suite on the roof was very clean, quite modern and reasonably priced! Location to 5th Avenue and the beach was great with in 5 minutes walking distance. We would highly recommend this complex!!! 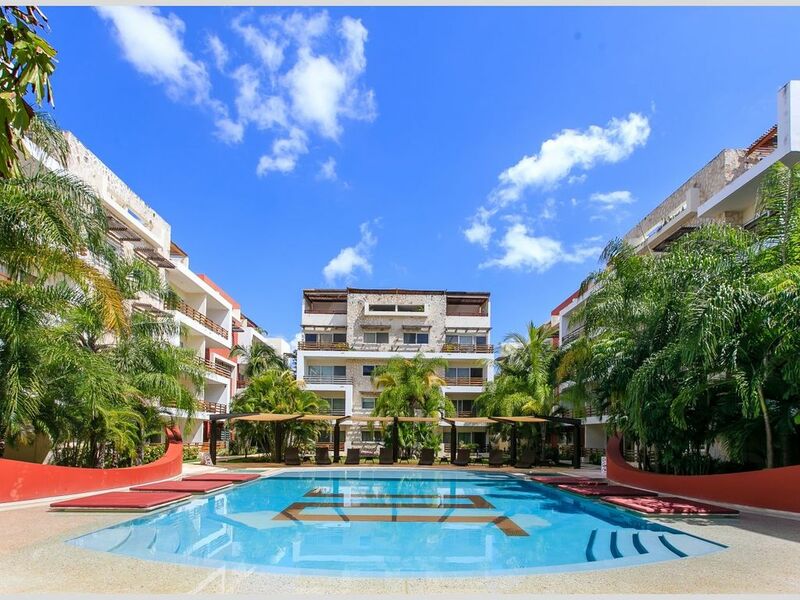 I recently traveled to Playa del Carmen and stayed in this condo. The living room and kitchen are actually outside on a half covered patio. 3 of 7 days we had to all hang out in the bedroom, because the patio area was flooded and the furniture soaked. The picture of the jacuzzi tub next to the stove is the size of a jetted tub for one person. This could be okay except it runs out of hot water way before it fills up so it's very cold. Furthermore, it is literally on the roof like maids quarters. So, after you take the elevator to the top floor you have to climb stairs to the roof. Last and most important, this property has front desk reception/ security ; however, 2 men were able to gain access to the grounds and entered our locked condo while I was sleeping. The two young men with backpacks entered, went all the way through the 2 bedrooms, and out onto the porch; when they stumbled upon my friends. Thankfully they were awake, and forcefully removed the men from our condo. We asked for 4 days for management to review security tapes. Never happened! Pros pretty good location and bedrooms were nice Cons gathering and cooking area outside in the elements, unsafe, poor property management, pictures are misleading, not handicap accessible. I stayed in this condo for last Christmas and in general I think it is a good option for travelers who want to be near 5th. avenue which is only two blocks away. However, there are some things that you want to consider before booking it. The kitchen is part of the terrace and the only "family room" there is so it is really important to keep it in good conditions and when we arrived we realized that it was not clean and there was wáter everywhere leaking from the floor ( apparently the jacuzzi was causing it and as a consequence we could not use it). This was very inconvenient because no matter how much you cleaned the floor there was mud everywhere!. The wifi NEVER worked, we were actually using other condo's signal because it was never fixed. The coffee maker was also in bad shape and could not be turned on unless you program it, The terrace is actually a balcony so if it rains it is actually impossible to cook or eat there and you will have go somewhere else. Every time you take a shower the bathroom floods so you never stop cleaning!! The building is nice but I think it is way too expensive for the service you receive. They charge you 80 USD if you travel with a dog for DEEP cleaning which is ridiculously high for a place which should be spotless for the price they are charging.